Shannon Colbert, with the Tennessee Aquarium, leads costumed characters across 11th Street on the way to a press conference Monday, November 16, 2015 at the City Hall to announce #CHAgives Day, which will be the Tuesday after Thanksgiving. Sign-wielding people in animal costumes were among the crowd that converged on the Chattanooga City Hall lobby Monday. An effort to do good. The focus was on a global movement, #GIVINGTUESDAY, and #CHAgives — its local counterpart. 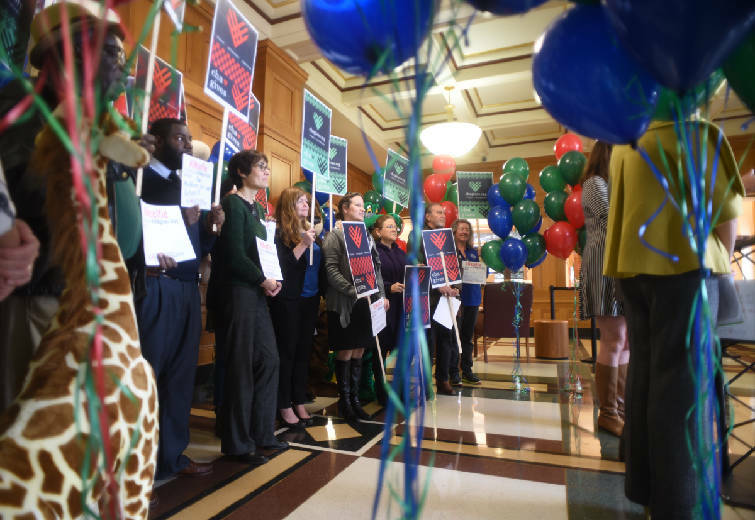 People gather during a press conference Monday, November 16, 2015 at the City Hall to announce #CHAgives Day, which will be the Tuesday after Thanksgiving. United Way of Greater Chattanooga and Causeway, with help from Mayor Andy Berke, were promoting Chattanooga's involvement in the movement focused on helping charities by giving to local nonprofits. The event was upbeat, and Berke found humor in the unusual scene. Noting the signs, he said, as mayor "you have got to give thanks and say, 'Whew, I'm glad they're here for this rather than something else.'" Lesley Scearce, president and CEO of United Way of Greater Chattanooga, explained what all the fuss was about. "We have a day for giving thanks. We have two days for giving deals — Black Friday and Cyber Monday," she said. "And so Tuesday, Dec. 1, will be our day for giving back." This is the first year the city has gotten involved in #GIVINGTUESDAY, an effort that arose in New York City in 2012. "We are a community that understands that we build a better place when we care about each other," Berke said. The United Way and Causeway, a local organization that also works on social causes, set a goal of getting 30,000 people to participate this first year. Abby Garrison, executive director of Causeway, laid out a plan for participation. "First, visit the website CHAgives.org, which includes a list of all the participating nonprofits and direct links to give to them. There's also a donate button at the bottom of the page where participants can give to a joint fund for United Way and Causeway if they don't have a favorite nonprofit listed." Next, she said, donors should tell stories on social media at #GIVINGTUESDAY and #CHAgives about why they are giving to the organizations and what the organizations do. Organizers also asked donors to post an "unselfie" of themselves — in essence, a selfie in which they explain why they chose to be unselfish and give. On Dec. 1, organizers will host a #GIVINGTUESDAY celebration at the Flying Squirrel bar and restaurant at 55 Johnson St., and 10 percent of the proceeds will go to CHAgives. If you aren't the social media type, you don't have to post, Garrison said; just give to a local charity on Dec. 1. CHAgives offers a way to uplift the community, said Berke, who wants the event to be an annual thing. "You build community when neighbors look after neighbors," he said. "That's the power that makes every city a better place." Contact staff writer Yolanda Putman at yputman@timesfreepress .com or 757-6431.